Karnataka elections: Will the governor follow the Goa and Manipur model that helped BJP? In Manipur, the Governor clearly said invite should go to the formation that will provide stability. The Bharatiya Janata Party is in a fix in Karnataka. At 5 pm on Tuesday, it looked like Karnataka was heading for a hung Assembly, with no single party getting a simple majority. At 5 pm, the BJP had won or was leading in a total of 104 of the 222 constituencies where polling took place on May 12. The Congress had 78, the Janata Dal (Secular) had 37 and independents two. In fast-paced developments, the Congress extended unconditional support to the JD (S). Together, their tally stood at 115 at 5 pm. If the two independents are added to this count, it becomes 117, which is well clear of the 112 seats mark necessary to form the government. 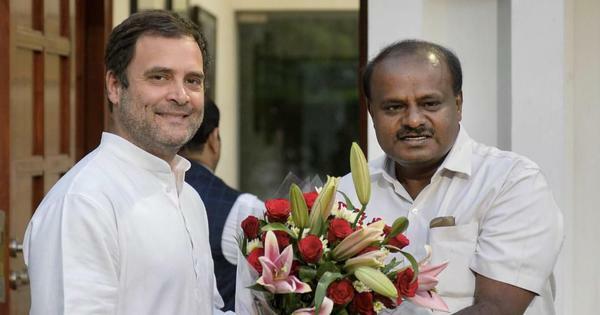 The deal was possible as Congress gave the chief minister position to JD(S) leader HD Kumaraswamy. However, some legal questions have cropped up. What would the Governor do in a situation where a post-poll alliance is put together to achieve majority? Should the Governor invite this alliance or the single largest party, which in this case is the BJP? What the BJP did last year in Goa and Manipur and in Meghalaya this year has come back to bite the party. Here, the Congress had emerged as the single largest party with 28 seats. But the BJP with 21 seats got the support of other parties after the poll and reached the figure of 31 in the 60-member Assembly. As far as the powers of the Governor is concerned, the Supreme Court in 1952 said that courts cannot interfere in the decisions made in the exercise of the Governor’s powers under Article 361. This Article made it clear he Governor shall not be answerable to the courts in the discharge of duties. The extension of this argument is that when a Governor decides to invite a particular person to form the government, the courts cannot interfere nor it can go into the reasons for the governor doing so. This 1952 judgement still holds the field in law. As Heptulla pointed out, the governor has to decide who has the best chance to form a stable government. But there have been times when the President, whose duties in government formation are similar to that of the governor in the states, invited the single largest party first to form the government. This happened with President R Venkatraman in 1989, when he invited Congress’s Rajiv Gandhi. In 1996, President Shankar Dayal Sharma invited Atal Bihari Vajpayee to form the government after the party emerged as the single largest. Given this history, the BJP would not be on a strong wicket if it argues that by virtue of being the single largest party, it should be the one to be invited by the governor first. In fact, when the decision of the governor in Goa in 2017 was taken to the court, the BJP had argued that the governor is not bound to invite the single largest party. Finance Minister Arun Jaitely had then argued that the governor was constitutionally right to invite the largest coalition to form the government. The BJP eventually went on to form the government in Goa. The Supreme Court did not cancel the governor’s decision to swear in Manohar Parrikar as chief minister but only set a date for the floor test. The party won this floor test.